We've teased it, we've chatted about it, and we've asked you to keep your eyes peeled... but now it's here! 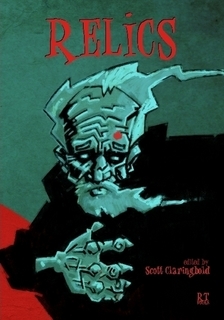 You can buy Relics, including the new Owl's Flower story "Clarity," right now from Red Ted Books! It's the first time Owl's Flower has gone afield from the main light novel series, but it won't be the last. Nothing published outside the primary book series will ever be required for understanding or following the story... but we have a feeling you'll enjoy this look into a slightly different side of the story's world. Pick it up now and enjoy... there's tons of other fun stories in the anthology, encapsulating different views of the life of immortals. More news is coming soon concerning books you can hold in your hand... stay tuned!